Indonesia as we know it today is a group of islands, which come together in the 300 year colonial history. It started with trade in products, which were rare in The Netherlands or barely known: spices, porcelain, silk, satin, diamonds, swords, rare gems, gold and tortoises. This trade brought riches for the entrepreneur. The Malaysians enjoyed maritime trade. 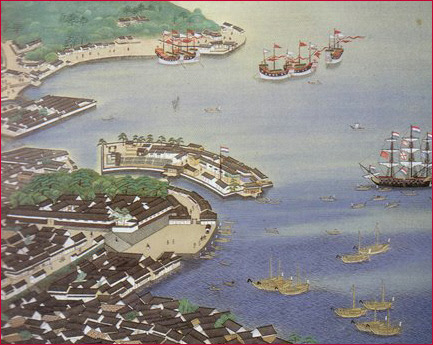 Malay developed over the centuries as the ‘lingua franca’ for traders and seafarers around the Strait. This became later the basis for contemporary Indonesian or Bahassa Indonesia. This was encouraged by the Dutch. The United East Indies Company was a trading company. It didn’t see the spreading of the Dutch language as one of its core activities. Dutch remained an official language, but only in a limited circle. In 1602 the United East Indies Company was founded. It was the first multinational company. It provided work for thousands and maintained a fleet of more than a hundred ship. Between 1590 and 1795 almost 4800 trips were made to Asia, where they owned a network of factories. These were not all of them under their control. They also owned land and islands. These territories were the beginning of the the later Dutch colony, Dutch Indies. The Malacca Strait was owned by the Company. This would enable the company to deny access to these regions for competition. Atjeh is the most northern region of Sumatra. It has long fought for its independence from the Dutch. It declared war against the Dutch in 1873. A long bloody war followed. When Indonesia became independent, Atjeh protested, because it never had been part of the Dutch Indies. Their resistance finally broke at the time of the 2004 Tsunami. In the period 1989-1998 there were more than 10.000 civilian victims. In the agreement signed on August 15 2005 permission was given for the formation of political parties. The United East Indies Company had less success in China and Japan. Attempts at trade with china failed and in Japan the Company was barely tolerated. The Dutch never got further than Deshima Island and were kept in isolation, away from the Japanese population. Other trading companies had even less access to Japan, primarily because the Spanish and Portuguese tried to convert the Japanese to Catholicism. They were literally slaughtered. The harbour of Nagasaki. Photo from 1820. It shows the Dejima Island, where the Dutch Flag is clearly visible. Because of a shortage of European women in the Dutch Indies, a mixed culture came into being, as well as an exchange of ideas and religions. The Indonesian population didn’t feel oppressed in terms of religion. The Dutch intervened in conflicts between local groups. Many saw the Dutch as their ally. In 1814 the term Dutch India was coined and a cultural system was introduced. This was seen as negative by the Indonesians. The advantages were the end of endless wars, financial compensation for farmers in a world economy which had operated without money. The local population prospered and internal trade and commerce increased. There were investments in rail and road networks. Many bridges were build. Slavery was abolished. Slavery was everyone around the world, also in the Dutch colonies, in particular in Suriname, Dutch Guyana. What is not reported in the history books is that the plantations in Suriname were primarily from English, French, German, Swiss, Spanish and Portuguese origin. In the 17th century the Dutch started the slave trade. This was managed by the West Indies Company. The Netherlands were one of the last countries to abolish slavery on 1st July 1863, 30 years after the British. This cost 300 guilders per slave. The slaves were then still not free. They still had to work for 10 years on the plantation for the Government. Then they achieved complete citizenship. Because people thought it high time that the Netherlands repaid the profit from the past, Queen Wilhelmina ordered a study to find out what had happened. This led to ‘Ethical Politics’: Irrigation, Emigration, Education’ was its motto. Batavia’s debt of 40 million guilders was waived, enabling a clean start. The notion of Nationalisation was introduced by a small group of intellectuals. However, the top functions remained in Dutch hands. The Ethical politics didn’t provide the fast growing population with healthcare and education. In 1930 there were only 667 doctors on Java. The time was right for Japan to make its move. Japan, however had no intention to give Indonesia independence. Indonesia was too important a supplier of oil and rice. The Netherlands has done much good for Indonesia. It was the best colony in the world. The Netherlands ended wars between Indonesians, piracy, the burning of widows, slavery, cannibalism, head-hunting and feudal oppression. All of Indonesia was opened up for the introduction of new ideas and technologies in many areas. However, too often self-interest was the main driving force.